THE MOST BURNING QUESTION IN MELBOURNE: Are you on board for the Barty Party? IS IT CRICKET TO LEAVE FOR CRICKET? Players in the past have left the tour due to pregnancy, a suspension, injuries or to study sports medicine or hotel management. Ash Barty left for two years to be a pro cricket player. “EVEN THE PRESIDENT OF THE UNITED STATES MUST STAND NAKED”: The great and almighty Roger Federer was stopped at a tournament security check point when he didn’t have his credential. SPIDERS GONE WILD: Before the Australian Open Nick Kyrgios suffered a spider bite. Right after Ash Barty’s scintillating win over Maria Sharapova, the Aussie Open’s Spider Cam crashed into the ump’s chair. The ump, Allyson Hughes, was stunned. A TALE OF TWO NAPS: After losing in four sets to Novak Djokovic, Canadian Denis Shapovalov said, “He’s good. I think he’s No. 1 good. He doesn’t give you anything. He baits you to try crazy shots. He moves you around and drains you. I’m kind of tired now. I want to take a nap.” BTW: Before the start of her 11:00 AM match against Amanda Anisimova, Petra Kvitova took a nap. 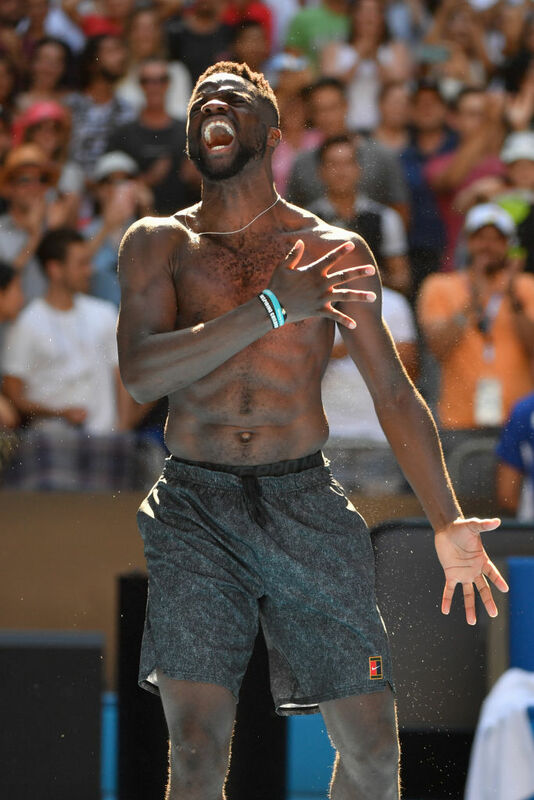 FABULOUS FRANCES FACTOIDS: Frances Tiafoe is a favorite in the locker room. After all, he has the biggest smile in the game. And the 21-year-old, who has wins over the No. 5 seed Kevin Anderson, the always dangerous Andreas Seppi and the No. 20 seed Grigor Dimitrov, has a lot more: power serves, a sprinter’s speed, NBA-like athleticism, an unconventional but deadly forehand, a brave willingness to charge the net, vastly improved volleys, the ability to change directions, backhands down the line that kiss the corner, well-disguised drop shots, a fascinating backstory and a growing consciousness of his place in the world. With his win over former ATP Champion Dimitrov, Tiafoe will be in the quarters against No. 2 seed Rafa Nadal. Since 2010, he, Tennys Sandgren and Andy Roddick are the only Americans to reach the Aussie Open quarters. Yes, she has her own jewelry company and, yes, here in Melbourne, she’s been a jewel. Never mind that she hadn’t won a single Slam match before going to Melbourne. In the third round she downed the No. 19 seed Caroline Garcia and today she dismissed Angie Kerber, the No. 2 who’s won Wimbledon and the US and Aussie Opens. A RISING STAR FALLS: A theme at the Australian Open has been the presence of players of Russian heritage. 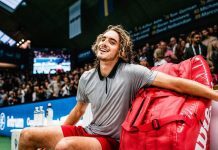 Among many there are Sascha Zverev, Stefanos Tsitsipas and the rising Americans Sonya Kenin and Amanda Anisimova, who was born in New Jersey but has a Russian background. After Amanda beat the rising No. 11 Aryna Sabalenka, Frances Tiafoe said it was a routine win – “barbeque chicken.” Yet today the Florida resident was “barbequed” by Petra Kvitova, whom she’d beaten at Indian Wells. But Anisimova, at 17 the youngest player to reach the fourth round at the Aussie Open since 2006, said she will be happy as she leaves Melbourne. She noted, “It was a very positive week for me.” Anisimova said she speaks Russian with her parents and players like Sharapova and Kenin. Plus there’s one thing for sure. We’ll be talking for a long time about the former US Open Junior Champion who’s a fabulous prospect. By rule she can’t play a full schedule until she turns 18 on August 31st. NO KIDDING: After the Jo Konta-Garbine Muguruza match finished at 3:12, Sloane Stephens said, “Tennis is the only sport that you can play at 3:00 PM or 3:00 AM.” Sloane then battled Anastasia Pavlyuchenkova. MR. WOZ SCHOOLS NICK: Caroline Wozniacki’s fiancé, the former NBA star David Lee, schooled Nick Krygios when the two played some one-on-one hoops.